Unlock the Potential of your Apps & Devices. Build One Connection to Deliver Data. Place your devices and apps in the hands of people and providers around the world. Deliver data easily to current clients while building relationships with new customers to increase the number of organizations and populations using your devices and apps. Join the Validic Ecosystem to eliminate the overhead associated with managing customer support issues, HIPAA compliance, and regularly changing security regulations. Connect in less than a month to begin delivering data to hundreds of organizations around the world – without the costs associated with supporting and maintaining an API. Validic augments telemedicine platforms by providing the patient data from wearables and in-home clinical devices used to aid care coordination, management, and decision-making. Validic powers population health management solutions by providing data from fitness and clinical devices to enable analysis of populations to target at-risk people with personalized interventions. We Help You Execute Technically. Validic serves as your technical advisor guiding you through digital health data integration and innovation. As your technology partner, Validic ensures you have access to the holistic insights, scalable functionality, and responsive support you need. Validic powers comprehensive and advanced analytics solutions with standardized and normalized data that can be leveraged for predictive population or person-level insights and trends. Join the Global Leaders and Innovators in Digital Health Technology. Make Your Mark in Healthcare. Join the Largest Connected Health Ecosystem. Validic has the relationships with the organizations to help grow your reach, presence, and brand. By ensuring you have the connections to the organizations you need, your company and team can focus resources on delivering the most engaging and sophisticated health technologies on the market. 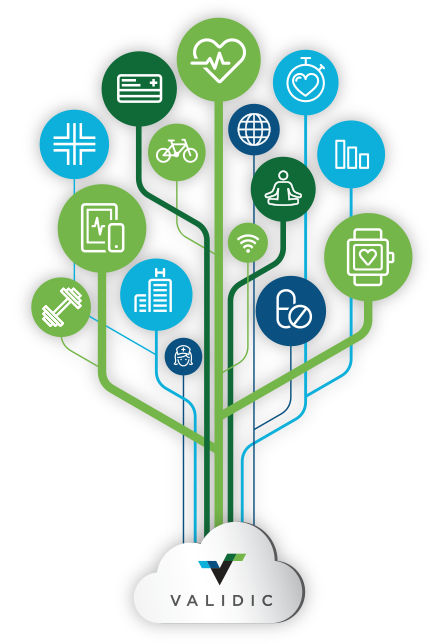 Find out how you can leverage personal health data to drive value for your consumers.